Illinois is in dire fiscal straits for a very simple reason: The state perpetually spends more than it takes in. The state has not passed a single balanced budget since 2001, despite a constitutional requirement to do so. One long-term solution to Illinois’ budget woes? Smart growth: Tying growth in government spending to growth in Illinois’ economy. Illinoisans could then rest assured they’re getting a state government they can afford. Illinois lawmakers have been on a spending spree. 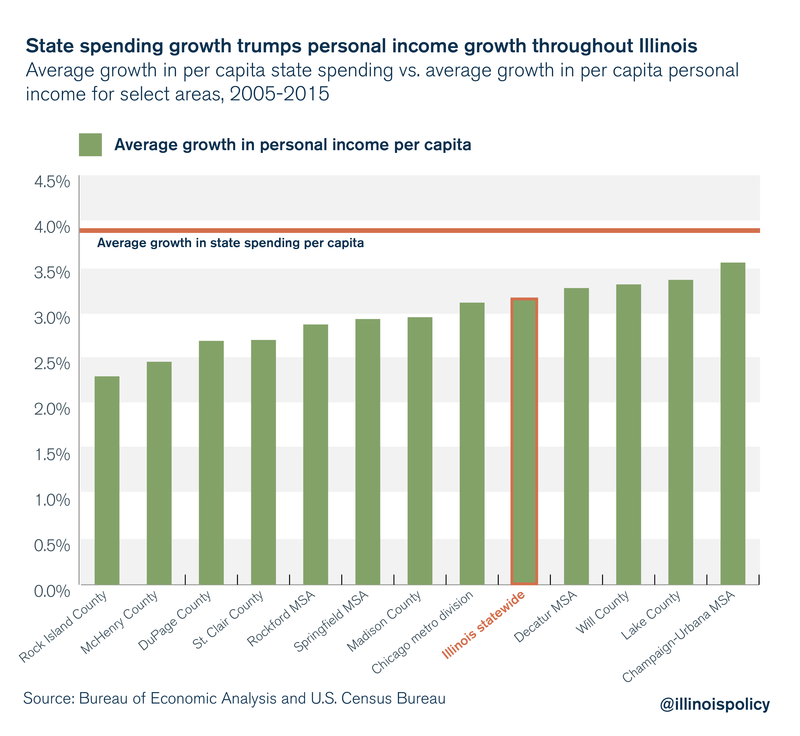 State spending per capita grew 25 percent faster than Illinoisans’ personal income per capita in Illinois from 2005 to 2015, and there’s no sign it’ll be slowing down anytime soon. Unrestrained growth in state government spending injects uncertainty into the lives of Illinoisans. That’s because lawmakers can do only one of two things when government spending outpaces growth in the state’s economy: raise taxes or mortgage the incomes of future generations by borrowing money. The threat of future tax hikes makes it more difficult for families to plan for their futures in the Land of Lincoln. Increasingly, they’re planning for those futures to be in other states. 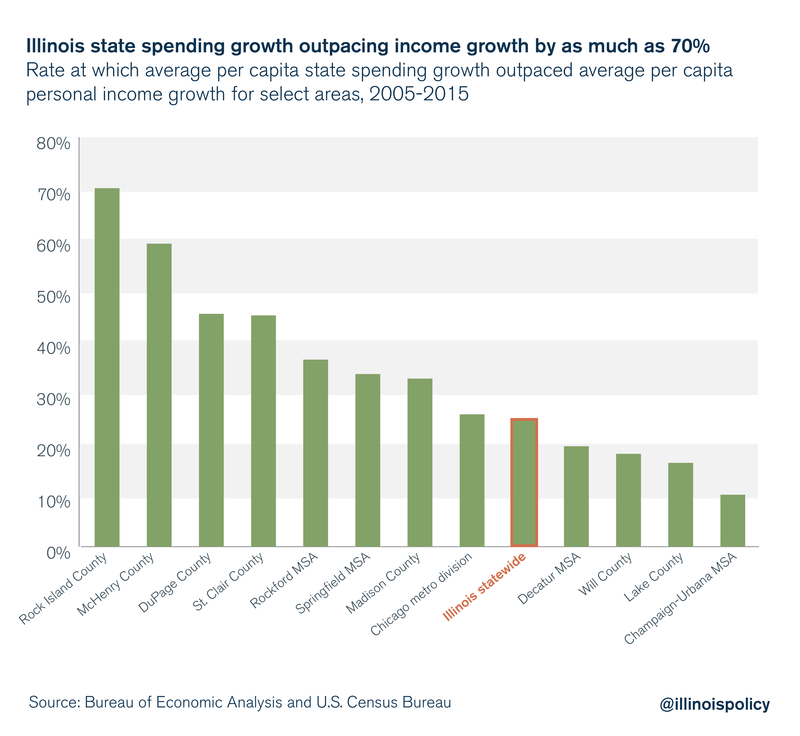 The rate at which state spending growth has outpaced personal income growth in some areas of Illinois is astounding. In Rock Island County, for example, per capita state spending growth outpaced per capita personal income growth by 70 percent per year from 2005-2015. Illinois needs to hold state lawmakers accountable – there must be some mechanism to force politicians to spend more responsibly. One trick politicians in Springfield use to “balance” the budget is simply not appropriating funds to pay their bills. The state’s backlog of unpaid bills alone reached $16 billion toward the end of 2017 – before the state borrowed more money to pay them down to $8 billion. Illinoisans may have expected that lawmakers passing the largest permanent income tax hike in state history in 2017 would have lead to a balanced budget. But shortly after the General Assembly passed the budget bill over Gov. Bruce Rauner’s veto, the Governor’s Office of Management and Budget found that the budget resulted in a $1.5 billion deficit. Even with the $5 billion tax hike, members of the General Assembly could not find a way to do what families across the state accomplish every day: spend within their means. This is not new in Illinois. In fact, in the past 10 years, state spending and outstanding debt has consistently outpaced revenues. 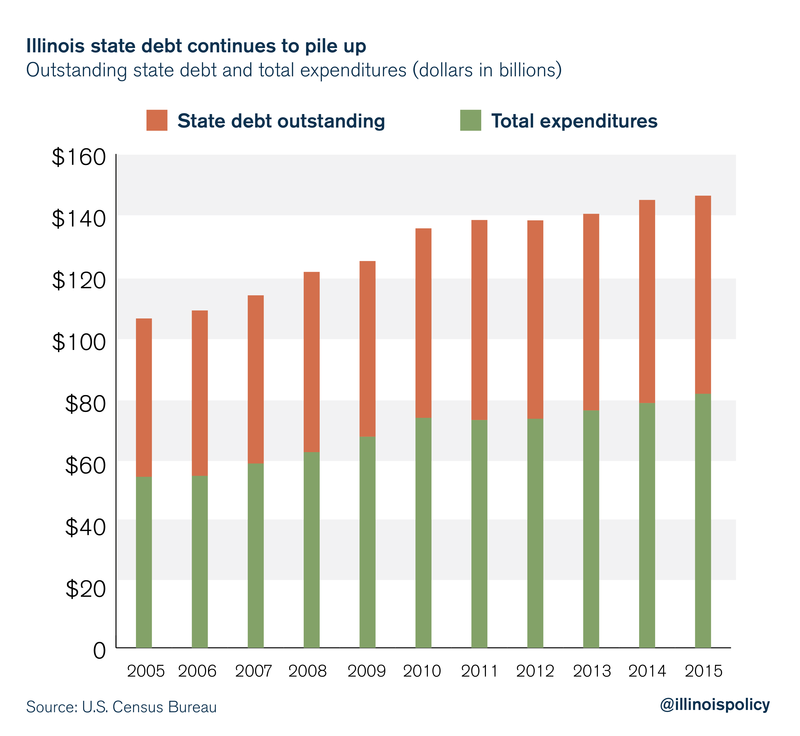 The state needs a tool to restrict the rapid growth of its debt and spending – an explicit cap on the growth of state spending, set at the growth rate of Illinois’ economy. According to the U.S. Census Bureau, Illinois’ outstanding state debt grew to $64 billion in 2015 from $51 billion in 2005 – an increase of $13 billion. This includes all debt obligations remaining unpaid as of 2015. And that $64 billion in outstanding debt does not include the $250 billion in accrued liabilities the state has promised to public pensioners, according to Moody’s Investors Service. Total state expenditures grew even faster. Between 2005 and 2015, total state expenditures grew to $82 billion from $55 billion, an addition $27 billion in spending. 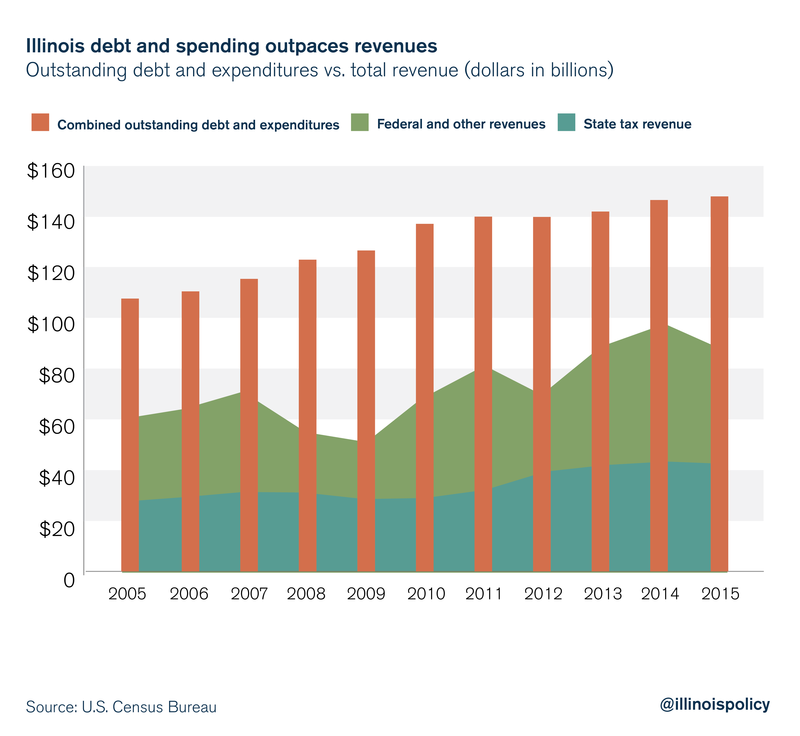 Illinois’ outstanding debt is already sky-high, and if the General Assembly continues its spending spree, the state’s revenues will never be able to catch up. The debt is increasing not only because of borrowing, but because of the interest that collects on the principal each year. And there’s no sign of the growth of debt slowing anytime soon. Without a way to restrict spending to responsible levels, that means even more tax hikes in the future. Continuously hiking taxes to pay for years of budget mistakes is a recipe for poor economic performance, meaning fewer job opportunities and slower wage growth for working Illinoisans. Most economists agree that when lawmakers raise taxes, economic growth suffers because of the negative impact of higher taxes on investment. This was the case with Illinois’ 2011 tax hike, and will be the case with the 2017 tax hike as well. Illinois has experienced a decline in investment. This is made clear by data from the Bureau of Economic Analysis, which show that noninvestment spending in the private and public sector has taken up an increasing share of Illinois’ economy. Declining investment means a reduction in not just the number of jobs in Illinois, but also in the quality of those jobs. Even just uncertainty over future tax hikes can be enough to drive investment out of the state toward a more investment-friendly, fiscally sound climate. A spending cap means restraining the growth of government spending to what taxpayers can afford. It also means averting the need for future tax increases. But with Illinois’ General Assembly, getting to that point is easier said than done. The state has already been saddled with skyrocketing pension costs by the Illinois Supreme Court. However, discretionary spending is one place where lawmakers can practice fiscal responsibility without running afoul of the courts. Members of the General Assembly should look to ways other states have enforced fiscal discipline. For example, the Texas Constitution restricts growth in appropriations to the growth rate in state personal income, with exceptions for constitutionally mandated appropriations or in case of emergencies. If the Illinois General Assembly would simply restrict the growth of state spending to 2.89 percent (the average annual growth in Illinois’ gross domestic product per capita since 2000), Illinois would be on its way to paying off its backlog of bills and eventually repealing the income tax hike. If the Illinois General Assembly could provide a basic level of certainty about the long-term growth of state government, and thus ward off future tax hikes, Illinois could once again become an attractive destination for families and businesses. The Illinois Policy Institute’s spending cap proposal is part of Budget Solutions 2019, a plan to balance the state’s budget without tax hikes or borrowing.